Did you know that you can have a ready-made website with awesome design and stunning usability just in a short time period and for a small sum of money? A website for your business doesn’t cost pretty penny anymore. The times, when it took days for your website to be done, came to the end. Welcome MotoCMS, the company that will change your perception of website building. One of the leading companies in website templates development has the large army of fans, including thousands of satisfied customers. MotoCMS continues to improve the high-quality product with respect to clients’ requests, taking into account the latest trends in web design. Make sure yourself by checking the website collection, including themes for commercial and non-commercial purposes. You want to create a website personally for yourself or for a large community? Whatever your website concept is, you will find what you are looking for. MotoCMS offers the best web templates for sports, art, design, politics, religion, education. The huge diversity of website themes, presenting the most popular life and business activities, is waiting for you. Throughout one week you have a big chance to get a cool, speedy and handy website design absolutely for free. Pick a template that suits the best to your website. Leave your comment below this post with a number or link of the desired template. The winner will be chosen by random selection. 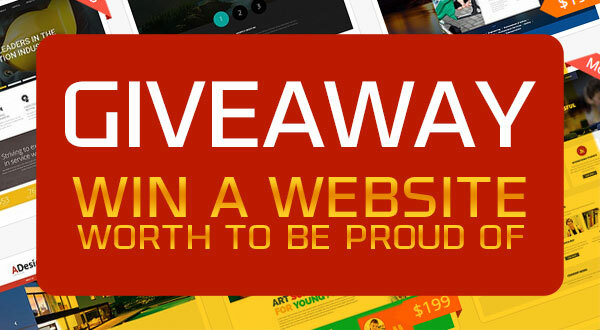 Don’t waste your time and win a website that is worth to be proud of! Do you want to make some changes in your new edgy website template? Use the admin panel, powered by MotoCMS. This drag-and-drop website builder with WYSIWYG functionality allows to satisfy your creativity and transform your website according to your needs. If you are a novice in website building, don’t worry! No extra skills in web design or coding are required. You will be pleased with the user-friendly interface. Customize your website in your own way due to various tools. Change style, size and position of text content. Alter the color design of the whole web theme due to fascinating Color Picker. This tool presents main colors, being used in your web template decoration. Each of these five colors generates five columns of appropriate tones. In total, you acquire amazing color palette that will help you to transform your website beyond recognition. Look through a few kinds of galleries and choose the one that suits you. Place a gallery in a form of grid or carousel. Don’t forget about sliders. They are also the great solution for graphic content demonstration. Do you like animation? Make your website template alive with 42 original animation types, applicable for various content blocks. You can view all animations in your admin panel. Parallax effect is another stunning feature, provided by the admin panel. This one of the most popular web design trends will make people literally stare on your website. All you need is to click on the Container area and check the parallax box. Media Library in the admin panel is the special area, where you are welcome to add your own personal content of different kinds. 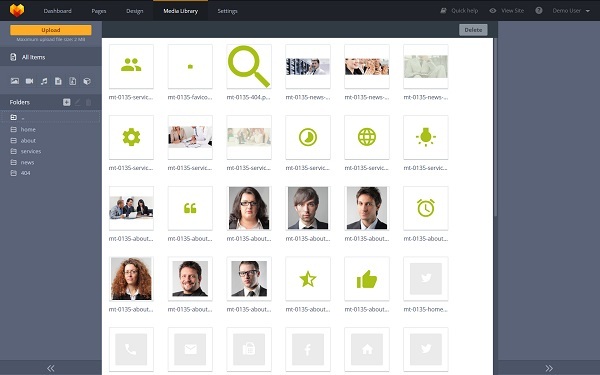 Here you can easily upload new files like documents, archives, audios, photos and videos. MotoCMS website builder is also stuffed with the broad variety of widgets that your website must definitely have. If you are a youtuber or Vimeo channel owner, you are welcome to demonstrate video content due to Video widget. Google Maps is the best means to tell customers your business address. 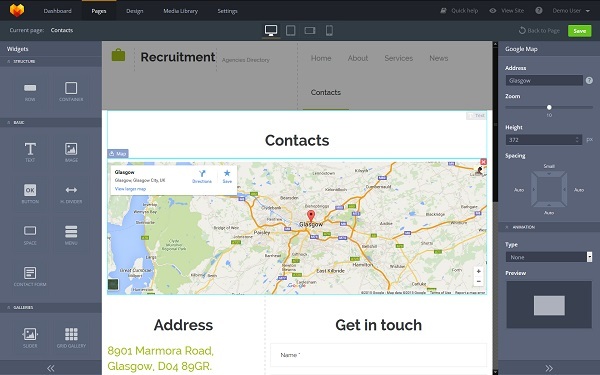 Just embed this widget to your website contact form and your clients will easily find your company location. 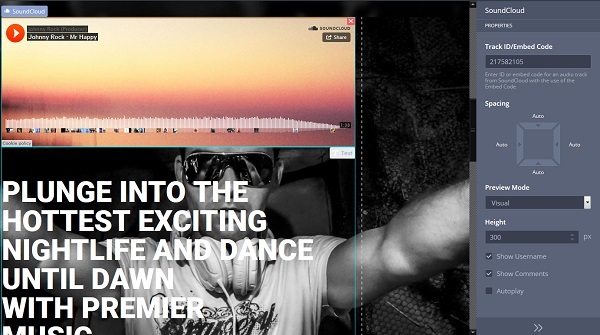 As for music producers, they will surely appreciate SoundCloud widget that is perfect for a music band website or a company related to music business. A few preview modes are available. Social networks became one of the most popular internet segments. Unite Facebook community and your website together. Drag and drop Facebook Feed for your website visitors to browse the latest news about your company. Do you have a Twitter account? If so, check out Twitter Timeline widget to embed it to your website. Are you signed up on Pinterest? There is the widget, especially for those, who like this photo sharing and publishing service. This is the great instrument to attract newcomers to your online representative. Disqus is another cool widget that allows to talk about events, projects, news and many other topical issues online. Do you want people to leave commentaries, while visiting your website? Here comes this service for opening up discussions of all kinds. MotoCMS prepared for you the best solution to start up commercial activity online. If you need a website for online store, get Ecommerce Plugin that is a ready-made tool for your store website management. Operate orders, see all the information about customers, sell products via great catalogue, consisting of various categories. 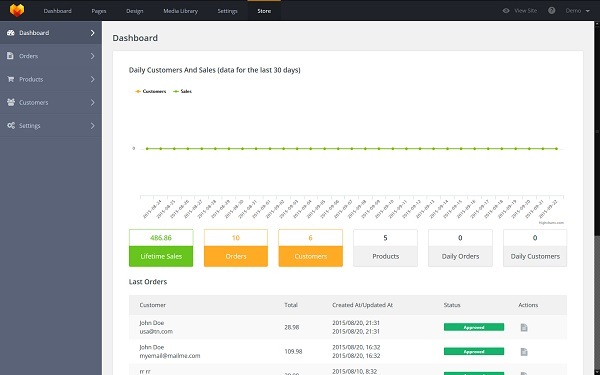 Full daily as well as monthly statistics is also available on the dashboard to track your web store work. Get this plugin as an extra offer for your MotoCMS 3 template. Another bonus that the winner draws with a fresh website template is 100% web design responsiveness. These days mobile devices are popular than ever among users, surfing the web. If you do business, you should realize that you must have not just a website, but its well-made mobile version. MotoCMS 3 templates layouts adjust automatically to any mobile device screen resolution without losing content. So your website visitors will enjoy the perfect website mobile version via smartphone or tablet screen. 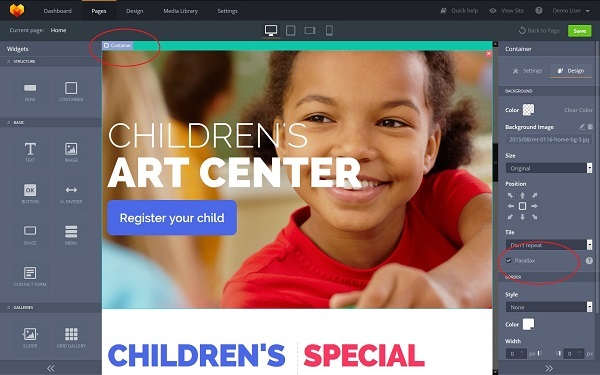 The admin panel powered by MotoCMS turns the process of your website theme transformation into kid stuff. But still, the company is always in touch with its customers, who take an interest in provided product and services. Please, feel free to ask questions to the professional customer support that works 24/7. You will be impressed with the most effective assistance. Expert operators will deal with questions you have (if such arise) in a few moments. Now you know that you can do completely everything in your own way, concerning building your website. Be manager, coder, programmer and web designer in the one skin. 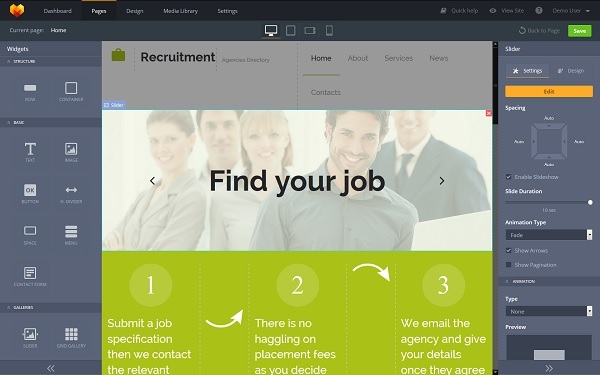 Enjoy an original and responsive website template that can be customized without efforts. Don’t forget that you have only one week to leave a comment below to win a website design that will be a good start in the conquest of online market. 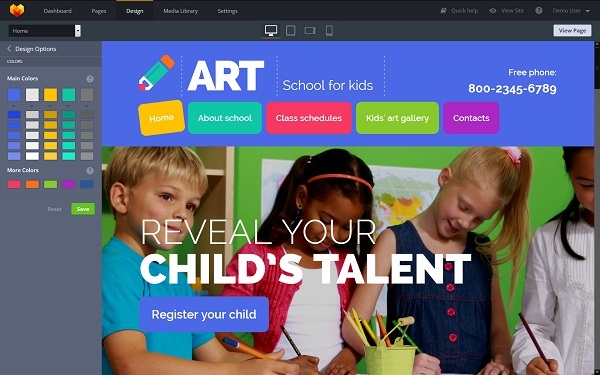 Try the live demo version of a website template and begin your customization right now. After your victory, you will get your website with the changes you already made. Join MotoCMS for your online business to be ranking, successful and prominent at the same time. Thanks, useful information, I will win. I like the MotoCMS for their visual approach to built a website. This will come handy to quickly built a webistes! Great templates, indeed! I love the colors and the user interface. My preferred time is template #47469. Get me that, would you? ? These are some wonderful collection of themes, best colors, loved the customization.